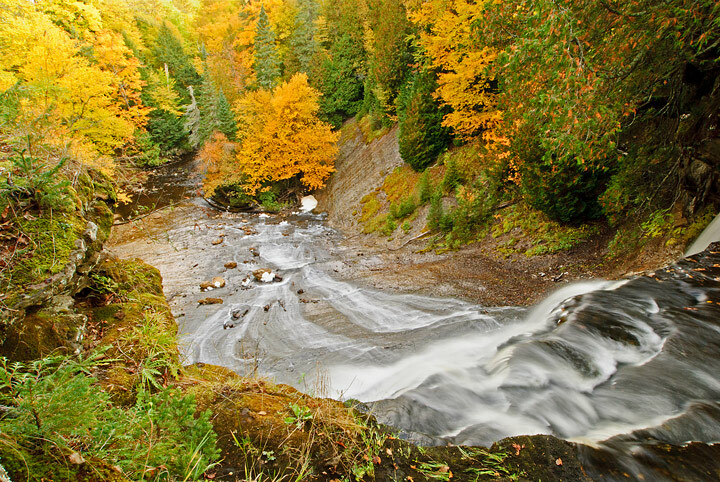 One of our favorite places to photograph fall colors in Hiawatha National Forest just south of Munising, Michigan. 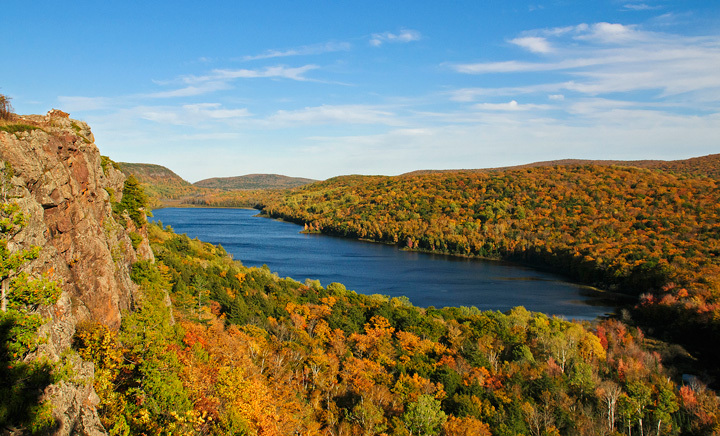 We have a route that we drive that passes a number of beautiful lakes. Sometimes the route changes a bit depending upon the number of photographers we find at any given lake. 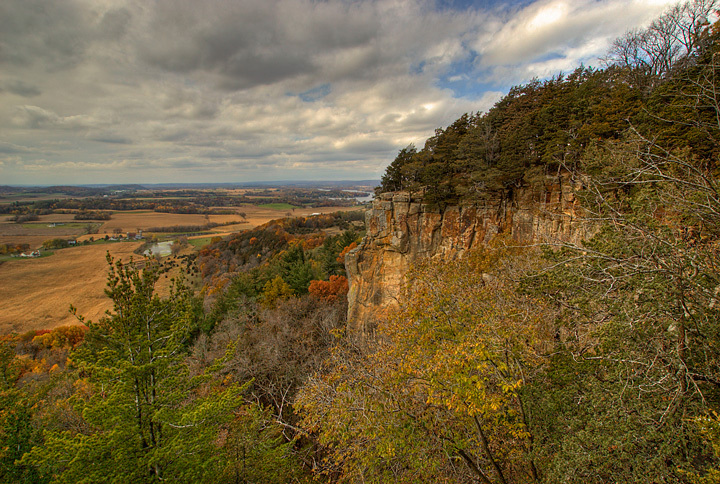 This area is a favorite destination for photography workshops so you can expect to find large groups of photographers a some locations. 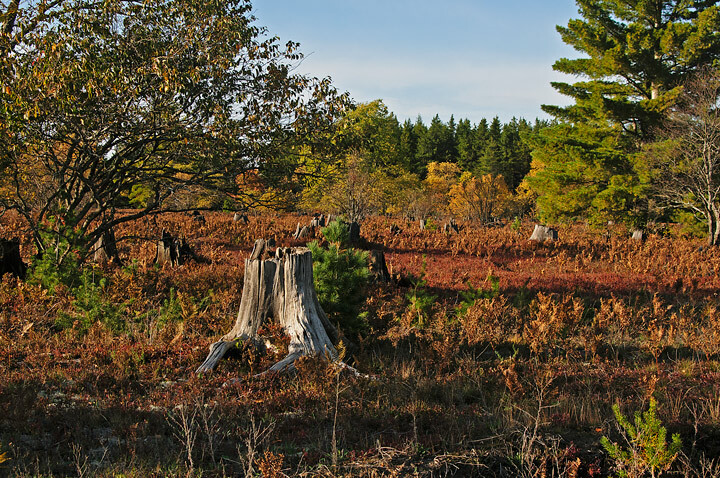 More photos from Hiawatha National Forest can be found on my website. Our first stop is usually Pete’s Lake. From Pete’s Lake we drive back toward Munising stopping at Moccasin Lake. There is a pull off right along highway 13. This is also a trail head for Bruno’s Run Trail which loops past a number of these lakes. 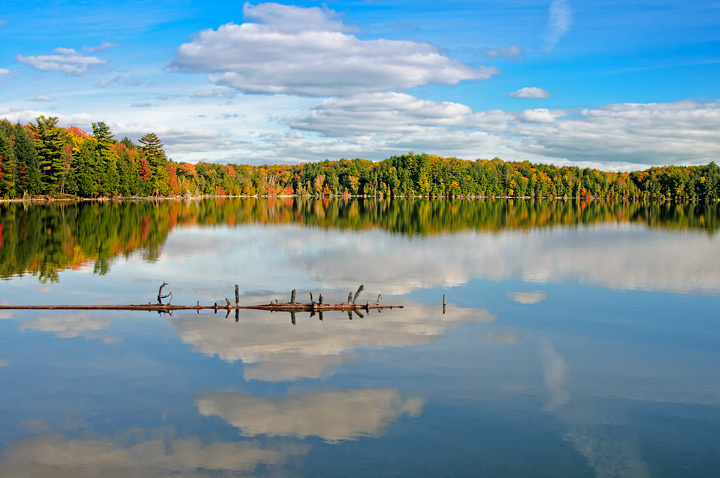 After photographing at Moccasin Lake we continued back toward Munising stopping at Thornton Lake. The turnoff for Thornton Lake is not well marked and difficult to spot if there are a lot of leaves on the trees. On this visit it was standing room only because a photography group was just packing up to leave. Continuing on toward Munising we turn off on Buckhorn Road and connect to Doe Lake Road. Just after turning on to Buckhorn Road you will encounter Twin Lakes. 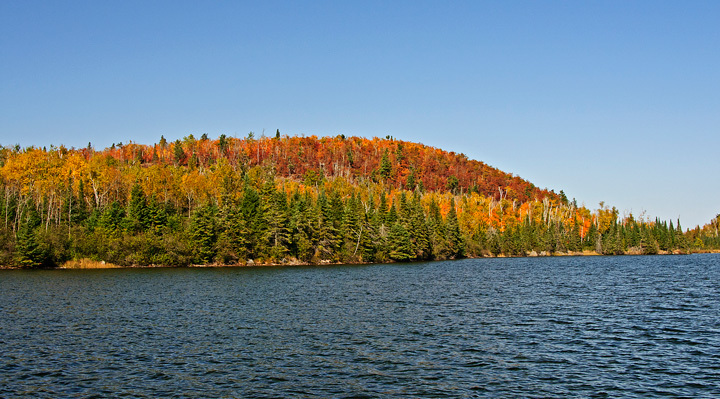 We then drove on to Doe Lake ending our fall tour of Hiawatha National Forest lakes. 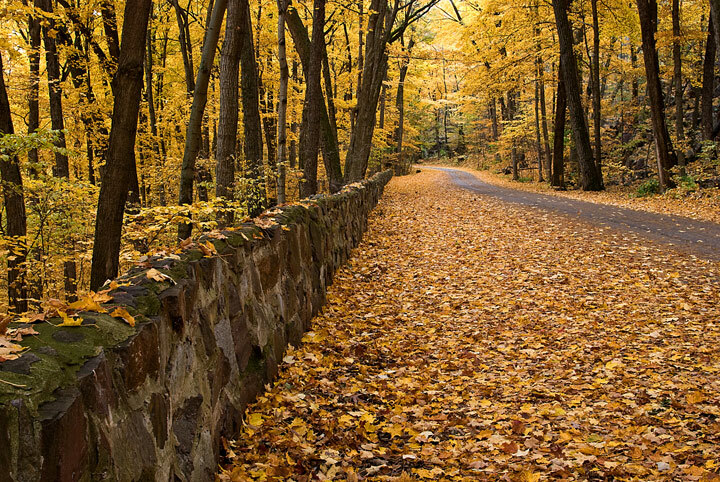 I’ve compiled a list of my five favorite fall photography destinations. The links go to additional photos on my website. 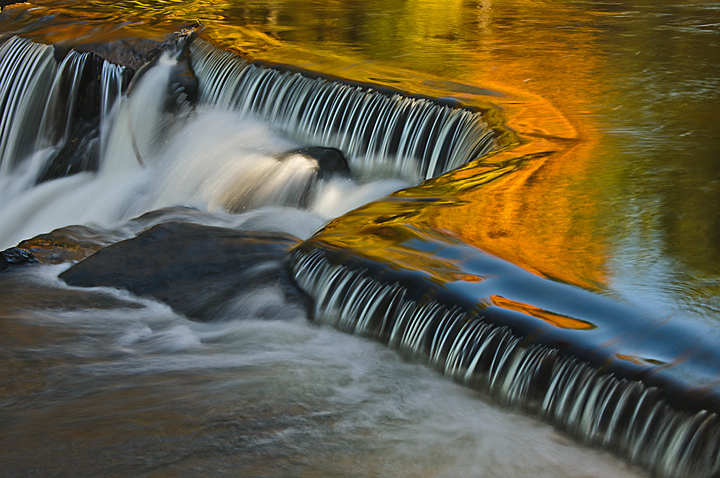 Black River– The black river offers some great waterfall photography but my favorite location is under the bridge at the mouth of the river where I love to take reflection shots. 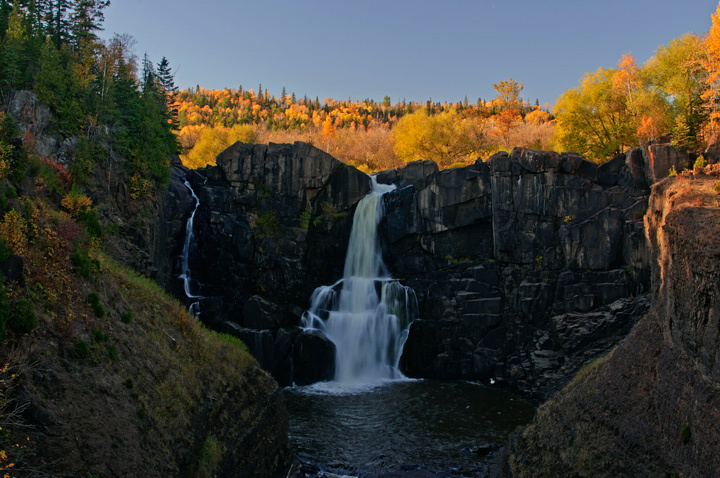 Bond Falls – One of my favorite waterfalls. 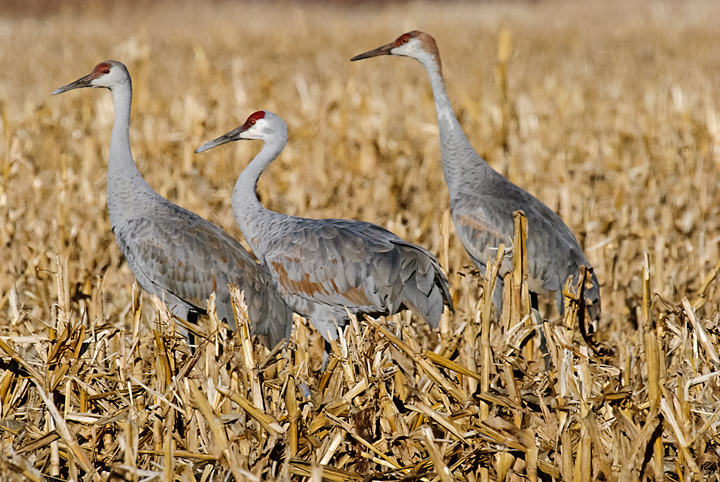 Expect large numbers of photographers at the start of the fall colors. 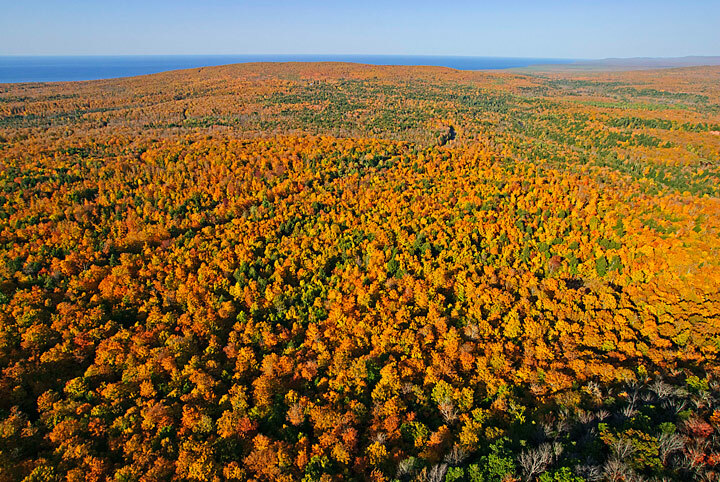 Copper Peak International Ski Flying Hill – Stunning views of the Lake Superior Basin. The ride to the top is a thrill in itself. 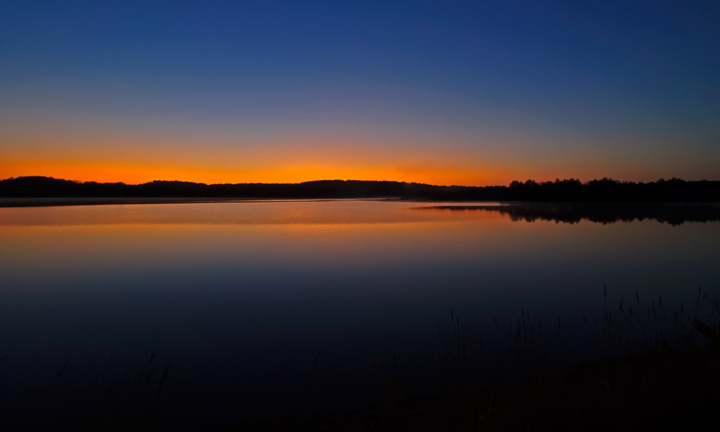 Hiawatha National Forest – A favorite location for fall photography offering a number of lakes that are best photographed at sunrise. See my Blog for more information on locations. 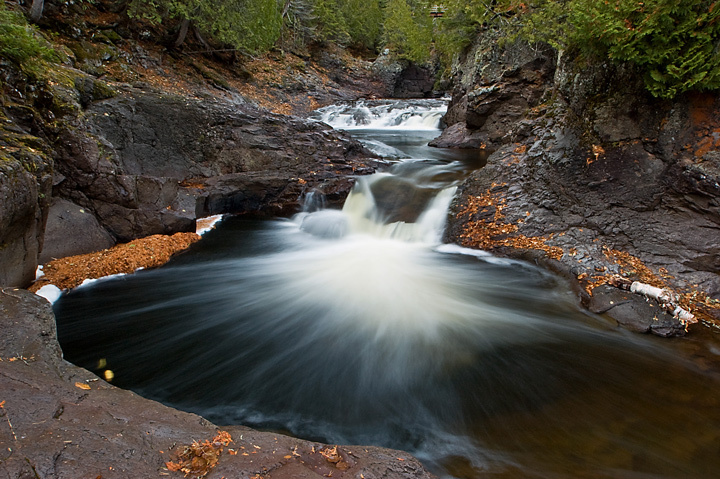 Porcupine Mountains Wilderness State Park – Offers a wide variety of photography locations from the Lake of the Clouds, Union Bay on Lake Superior to mountain streams and waterfalls. This week our trip of the fall was a little more extensive. 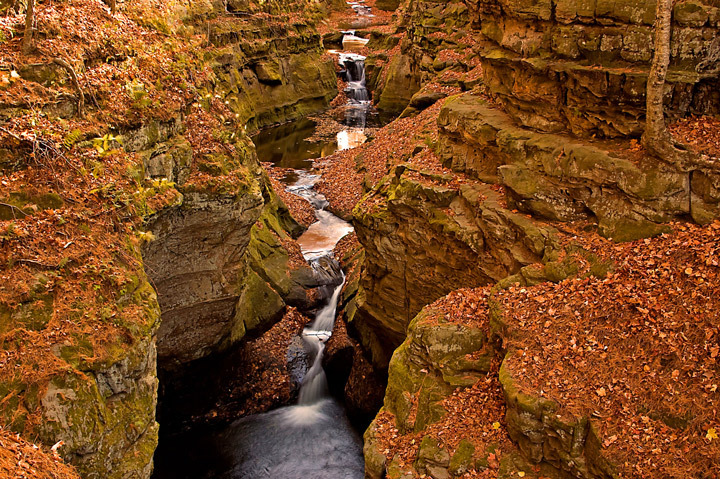 Our destination was Munising, Michigan. Our drive took us through central Wisconsin on highway 29. There were spots of color and some nice color around Shawano, Wisconsin. 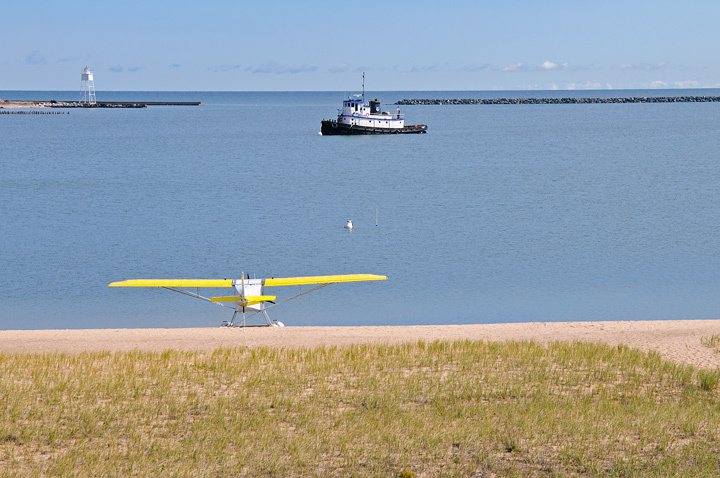 From there we headed north to Escanaba, Michigan. There wasn’t a lot of color on this portion on the trip. We then headed north on highway 2 . 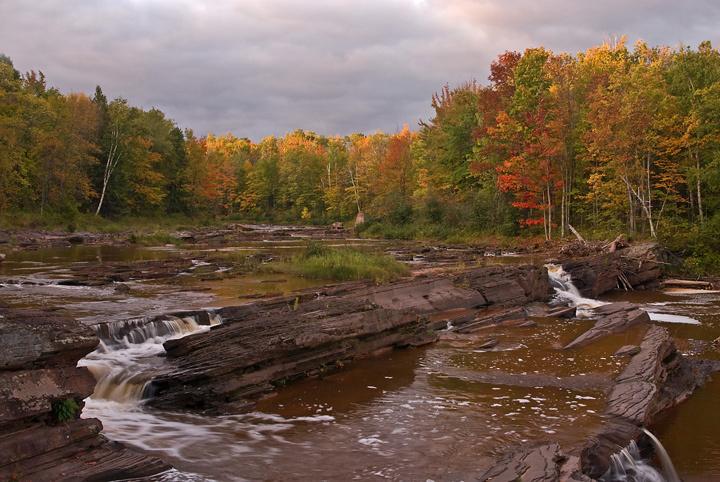 The objective was to catch highway H13 through Hiawatha National forest into Wetmore, Michigan. Although the first day was a little disappointing things picked up on subsequent days. 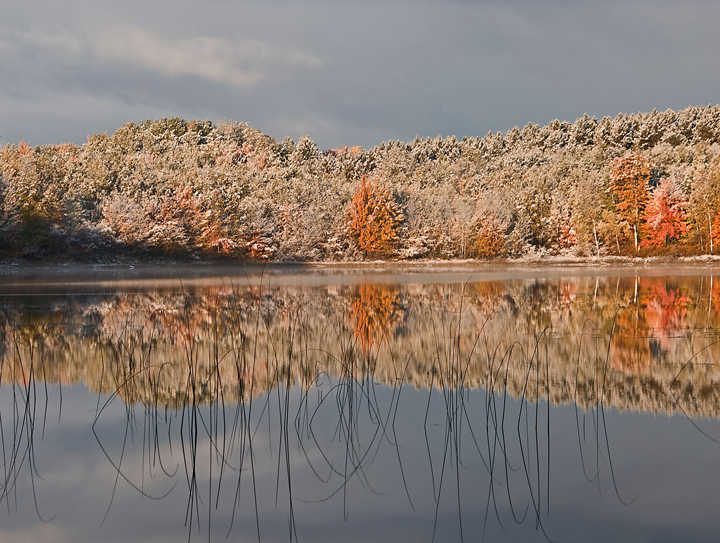 I wanted to check out the colors in Hiawatha National Forest and see where the good color was for the next morning. Our first stop was at Pete’s Lake. As you can see the color was not at its peak but it looked like a possibility. However, I was very disappointed to see that they had logged in the park. Many of the beautiful trees that I loved to photograph had been cut down. We then stopped at Moccasin, Thornton, and Big Twin Lakes on the way into Wetmore. 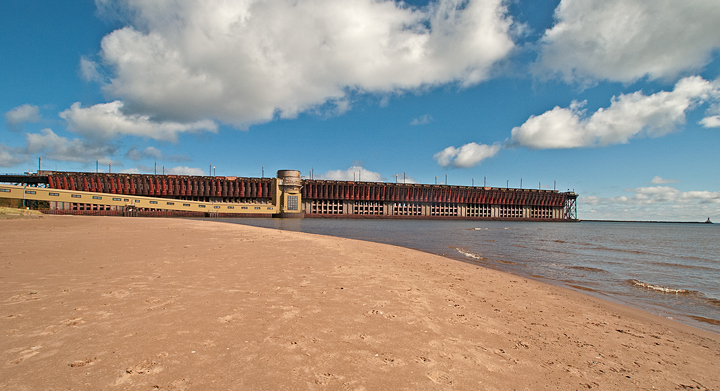 I was again very disappointed because the lakes were extremely low with lots of weeds and other debris showing. The colors were not up to previous years. Many of the birch were just turning brown rather than turning a bright yellow. By the end of the lake visits I decided than it was not worth a sunrise visit because I already had better photos of these lakes. This shot was from several years ago. After checking into our motel and having a bite to eat we headed out to my favorite sunset location at Miners Beach in Pictured Rocks National Lakeshore. About halfway to the beach we encountered road construction. The highway department had applied tar to one side of the road so traffic was one way. Normally in Wisconsin we apply tar with a pea gravel coating but apparently Michigan just uses tar. It wasn’t drying right so they were having to direct traffic on to a single lane. We continued on to Miners Beach. 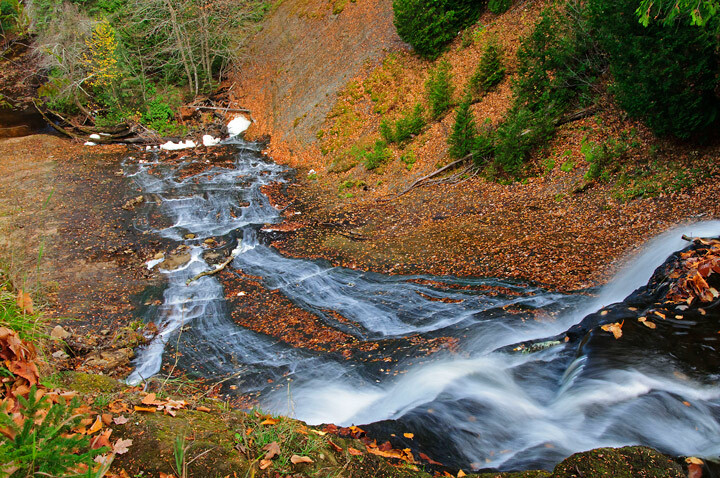 Elliott Falls was but a trickle and there was not a lot of color. The sunset wasn’t much but I took a few shots. We decided to leave early because of the road construction. The tar was still wet and they were still directing traffic after dark so I didn’t get any tar on the car. 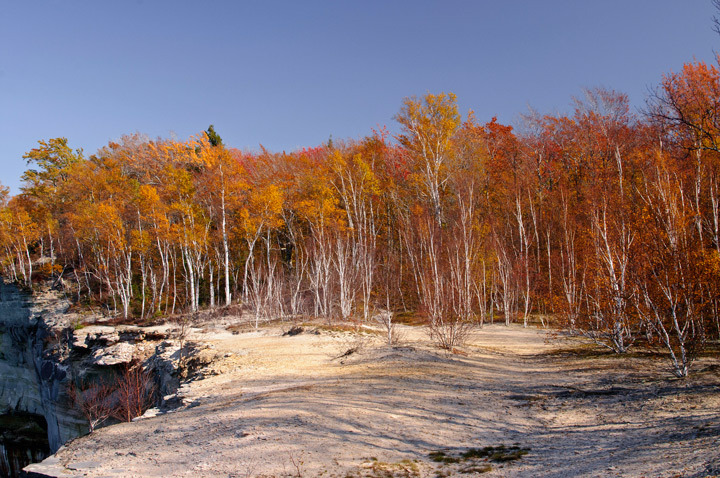 Given the lack of really good color around Munising we decided to drive over to Seney National Wildlife Area. On the way over there was fog in the low areas so I thought it might be interesting in Seney. I was right. There was a fog over most of the ponds. If you ever wondered how many spiders were around you got a good idea on this day. The heavy dew covered the spider webs and there were literally thousands of them glistening in the sun. Even many of the trees were covered in spider webs. 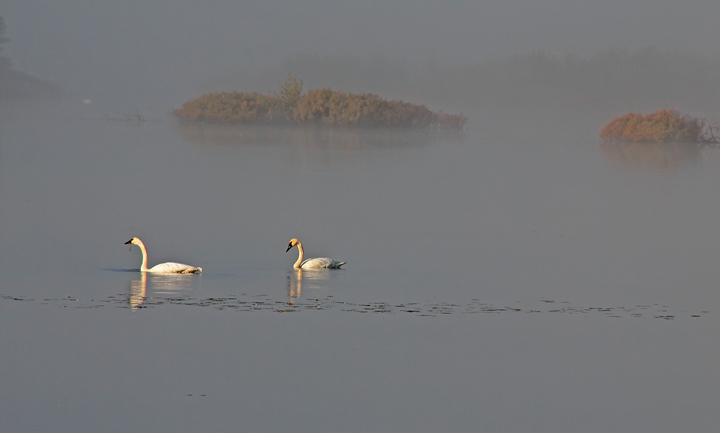 Seney provided some great photography opportunities with the early morning fog. We also saw quite a few Trumpeter Swans, hawks, ducks and even a Blue Heron. 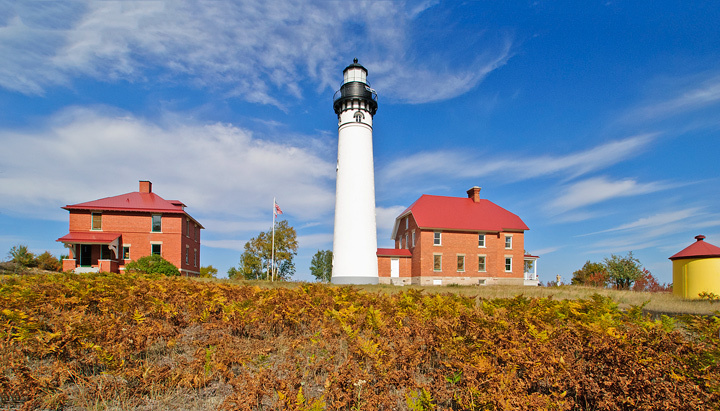 We then headed down highway 77 toward Grand Marais, Michigan with our eventual destination Au Sable Light Station. The trees along Highway 77 had some good color. In Grand Marais we checked out the work being done in the harbor. It is undergoing a major 30 million dollar renovation. They are in the process of dredging and rebuilding a massive breakwater in the harbor. The new rock breakwater can be seen on the right. We headed out to Pictured Rocks with our first stop was the ranger station. As we drove into the parking lot we noticed a truck with a stunning photo on the door and Petersen Photography below it. When we went into the station Paul Peterson was talking with the rangers. 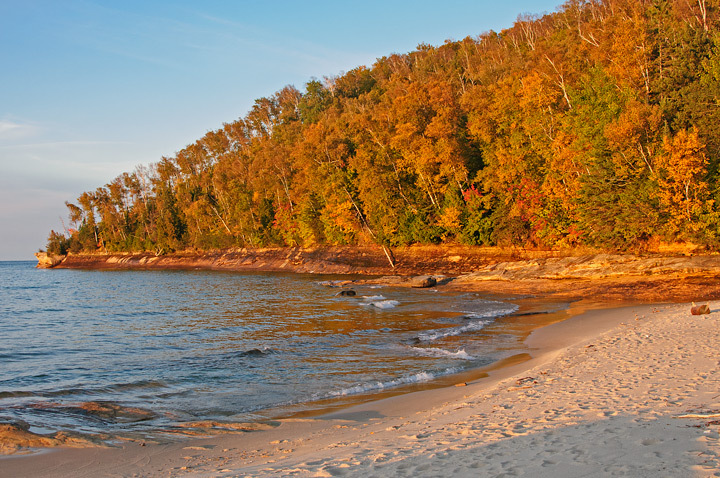 Petersen was an Artist in Residence at Pictured Rocks. 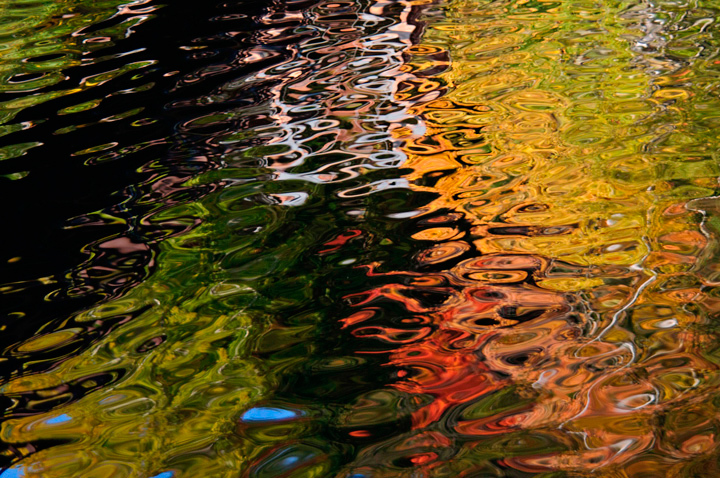 Check out his website for some great photos. When we drove through Grand Marais we noticed a sign for the Lake Superior Brewing Company. My wife ask how the food was and it was given rave reviews for the food and beer. We decided it would be worth a visit later in the day. We drove on to the Hurricane River where the trail to Au Sable Light Station starts. We don’t walk the trail because walking the beach is much more interesting. 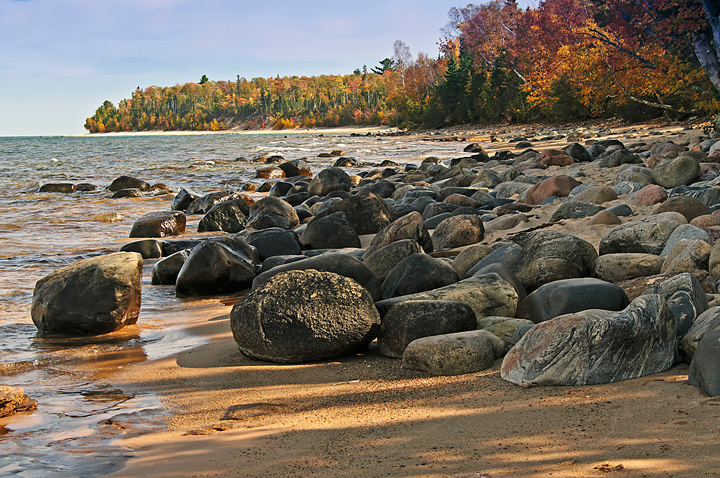 The 1.5 mile walk is along a combination of beach and rocks. Depending upon the water levels and wave action you should have no problem hiking along the beach. 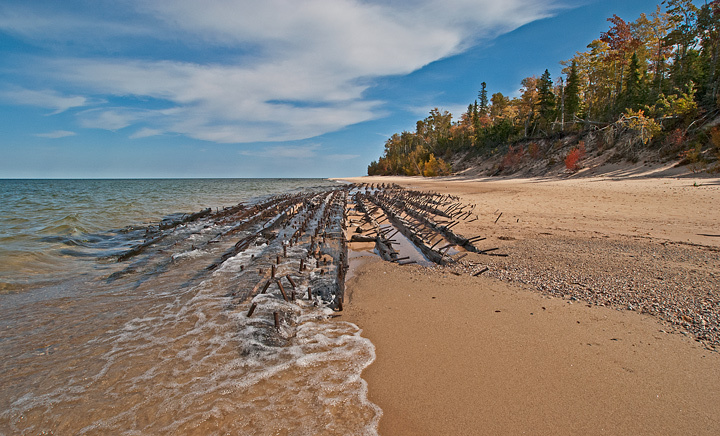 Along the way there are a number of old ship wrecks that can be found. The first is not far from the Hurricane River parking lot and the others are just before the Light Station. This year the lake appeared to be low and the wrecks were more exposed than I had seen them in the past. It was a beautiful day for a walk and photography. After the hike we decided to drive back to Grand Marais and have an early dinner at the Lake Superior Brewing Company. It was well worth the drive back to Grand Marais. The food and beer were as advertised with a nice variety of both. The only problem I had was there was too much food. I’ve been trying to lose a little weight and having a half pound olive hamburger with fries didn’t help. After dinner we decided to drive back along highway H58 to Grand Marais. The colors were outstanding with the late evening backlighting. I suspect they will reach their peak around the first weekend in October. On the drive back we stopped at Kingston Plains in the Lake Superior State Forest to take a few photos. This area was repeatedly burned off during the logging era. 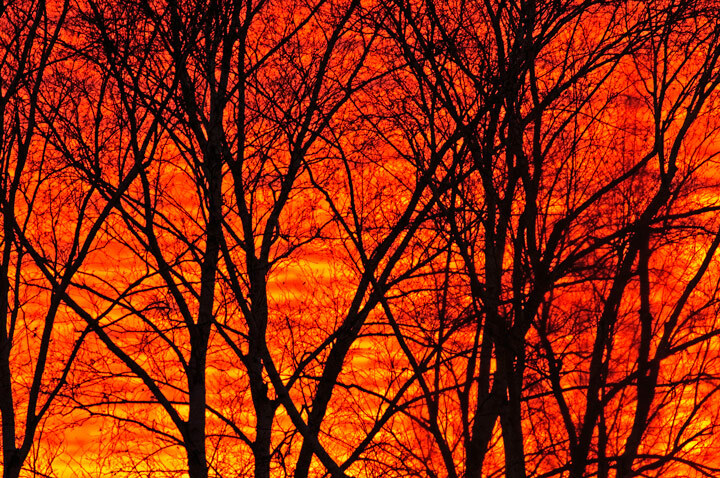 It is speculated that the fires were so hot that it virtually sterilized the earth. Trees are growing now but it has been a long process of regeneration. We expected to reach the Munising area around sunset and normally would have stopped at Miners Beach but decided that they were probably still working on the road and I didn’t want to risk getting my car covered with tar. 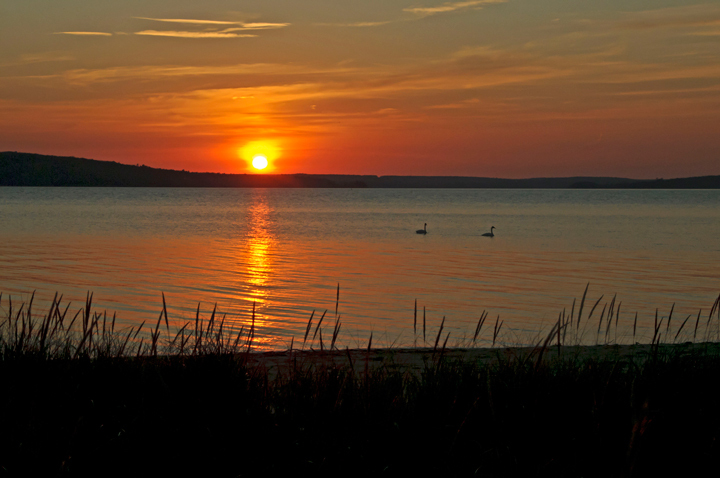 Our second choice for sunset photos was Sand Point in Munising. As we drove past Munising Falls I noticed that the parking lot had recently been tarred. This should have raised some red flags but it didn’t. After a couple of miles we could see that they had traffic control setup and had tarred one side of the road. We decided to head back to the motel. Too bad because it looked like a nice sunset. This photo was taken at an earlier sunset. 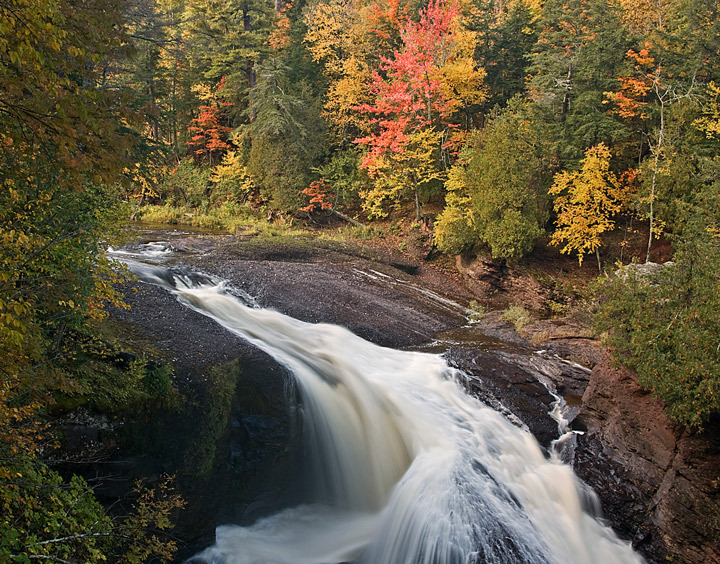 On day three we planned to take the short drive over to Marquette, Michigan. 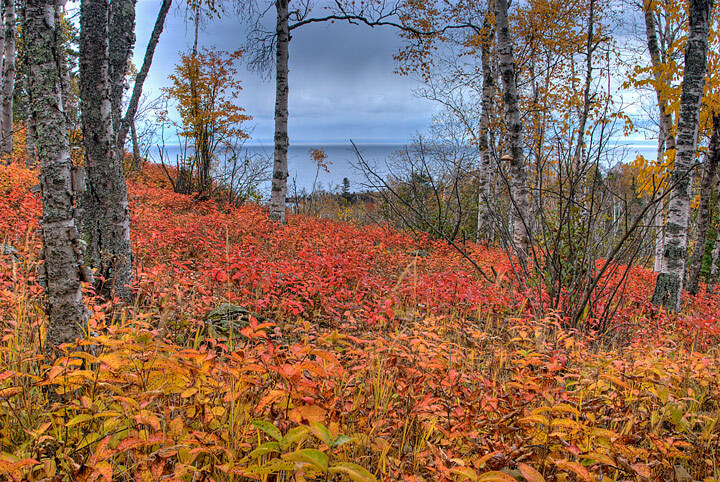 We have never stayed in Marquette and wanted to check out the photography opportunities for a future visit. We stopped at Au train Falls and Laughing Whitefish Falls along the way. Laughing Whitefish Falls was outstanding in terms of fall color but there was not a lot of water going over the falls. 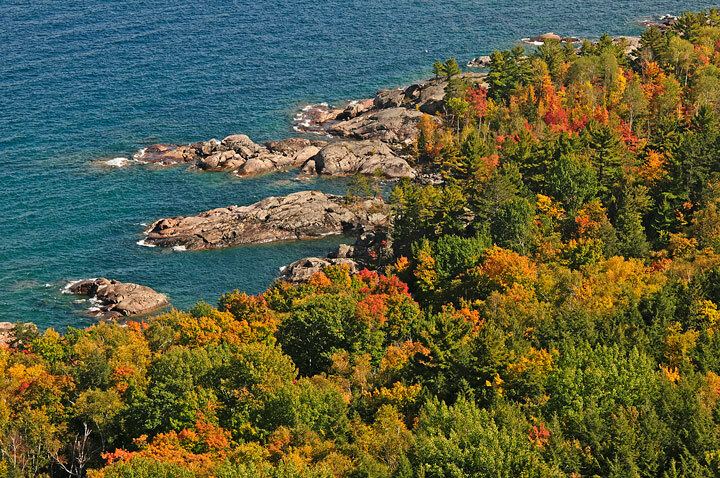 The fall colors on the drive to Marquette were good and probably will peak the first weekend in October. Our first stop in Marquette was the visitors center. It was well worth the stop. The individual who helped us was one of the most knowledgeable and enthusiastic that I’ve ever met in a visitors center. He gave us all kinds of tips on where to go and what the fall colors would be like. So many tips that it would take a long weekend to take it all in. Since this was a reconnaissance mission we are now well informed for a for a much longer visit in the future. We drove out along Lakeshore Boulevard to check out the sites along the Marquette waterfront. It was a beautiful day for sightseeing and photography. 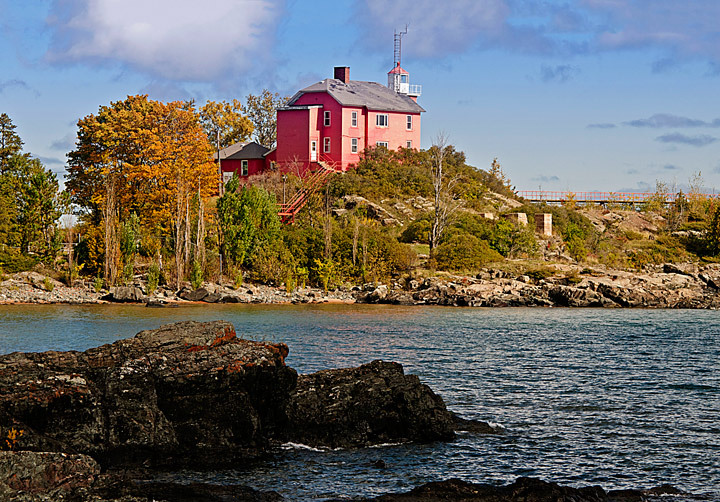 The highlights of the waterfront were the ore docks and the Marquette Harbor Lighthouse. This looks like a great place for some sunrise photography. We drove out of town to Presque Isle Park and drove the loop. This is going to be well worth a longer visit. 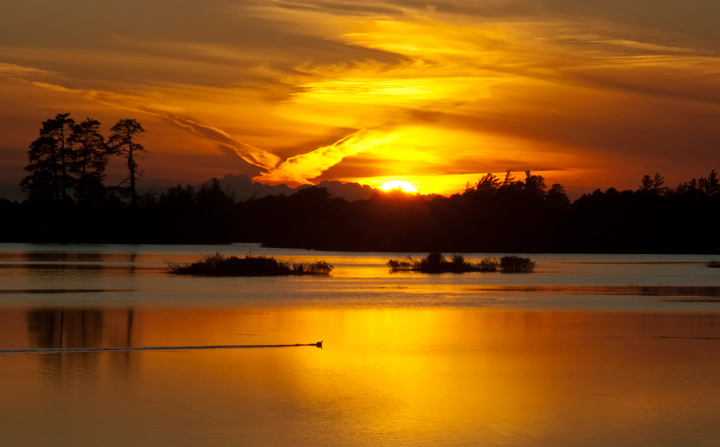 There is a location to take sunset photographs and that’s on our list for next time. We decided to head up to Big Bay which is about 30 miles up the coast. The visitors center recommended a number of stops along the way and we had already noted some nice hiking trails to waterfalls. One of the recommended stops along the way was Sugarloaf Mountain. When we arrived the parking lot was full and there were cars parked all along the road. This was definitely a hot spot on a beautiful fall day. The trail to the top was well developed and nice sturdy steps had been constructed. I heard someone say that there were 182 steps but I didn’t count them. We later found out there are 304 wooden steps. The view from the top was an outstanding 360 degree view and well worth the hike. As you can see the fall colors were nice but they should really be good the first weekend in October. We drove on to Big Bay and decided to drive out to the Big Bay Lighthouse. 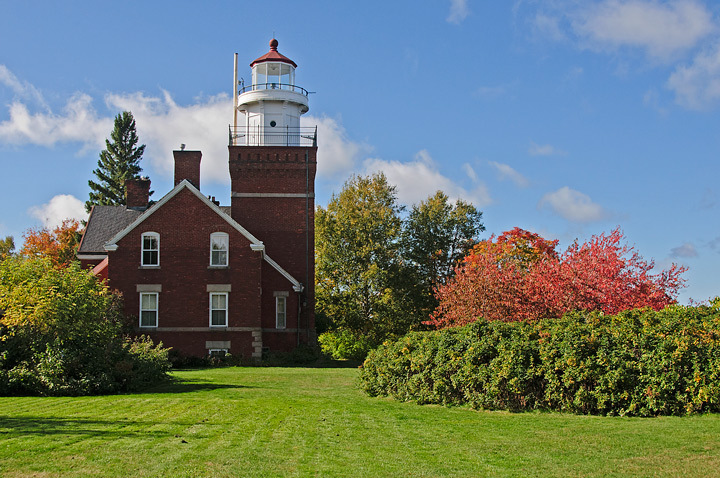 The Lighthouse is now a bed and breakfast but the grounds are open to the public from 10am to 4pm. We made it with 15 minutes to spare. 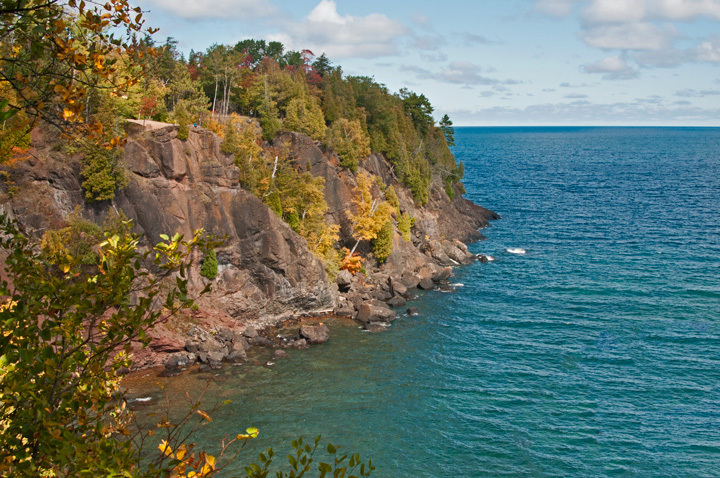 What a beautiful location to enjoy the serenity of Lake superior. We then headed back to Marquette and after a late dinner called it a day. On day four we headed down toward Bruce Crossing, Michigan. Our main destination for the day was Bond Falls. The colors were nice all the way to Bond Falls although there was quite a bit of fog along the first part of the trip. I told my wife we had to more it along because it would be crowded at the falls. She didn’t think very many people would be out on a Sunday morning. I thought there would and the bet was that we would see more than 30 people. Looser buys the ice cream. As it turned out I was right there were more than 30 people at the falls but not as many as I expected and I only saw three other serious photographers. I’ve made many visits to Bond Falls but this is the first time I’ve been able to visit at the peak of fall colors. 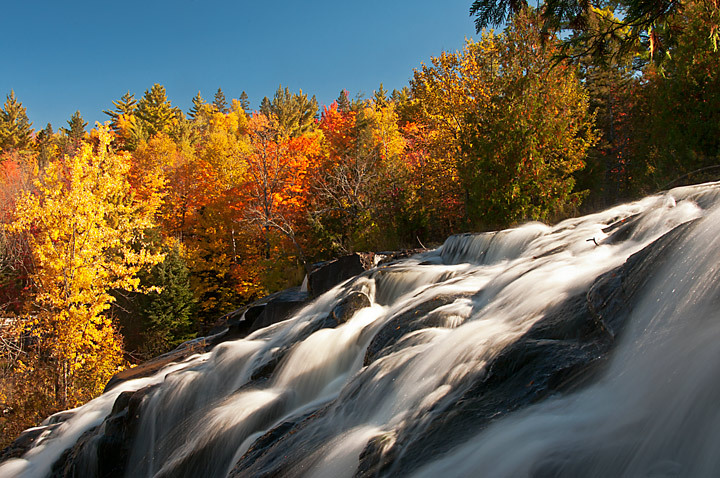 Bond Falls is probably the most photographed waterfall in Michigan and for good reason. There is a lot to photograph and since the falls is below a dam the water levels are good even during this year’s drought. We then headed home after a very successful trip. 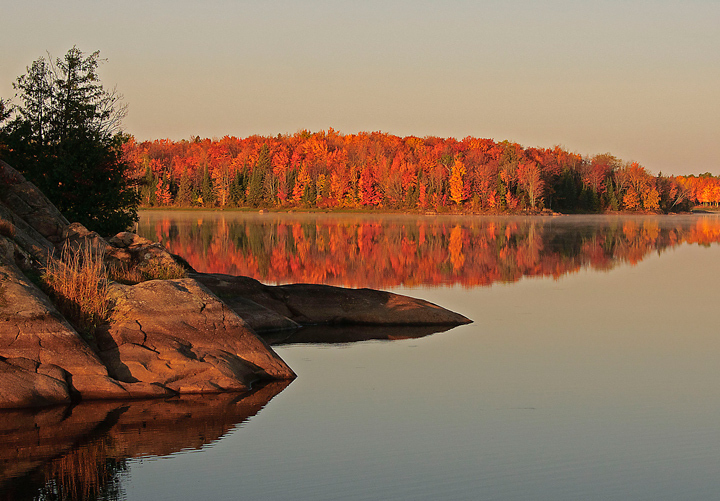 The colors are nearing their peak all over northern Wisconsin and the U.P.